The Dream escaped the Stars, 81-79. Alana Beard keeps rocking in LA. Beard blogs about LA restaurants. 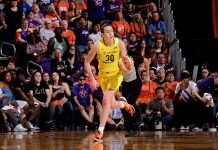 The Shock – yes, the Shock – is soaring in the WNBA. Odyssey Sims blogs, and she does it well. The Mystics are making strides despite some road game stumbles. The Storm are searching for answers to their fourth-quarter struggles. The Dream chilled for charity. The battle-tested Lynx seem ready to make a run in the West. Video of a recent Lynx meet and greet. Brazil’s National Team is a good measuring stick for improving the Canadian squad. The Plouffe sisters are back together, playing for Canada.